The quiet, white sand beaches of Phang Nga invite guests to relax and take in the beautiful scenery. Easily accessible from the highway, Phang Nga holds the charm and serenity of Thailand by bringing visitors to quiet and picturesque beach towns. With a variety of active beaches, offering swimming, snorkeling, restaurants, shopping, boating, and tours, to isolated and quiet beaches for relaxing and long walks in the sand, Phang Nga has something for every interest. Khao Lak Beach is an excellent sandy beach, perfect for swimming. With interesting rocks of all shapes and sizes, majestic pine trees, and outstanding coconut groves, this beach offers a sense of tranquility and relaxation. Across from the beach is the Chaopho Khao Lak Shrine, an important shrine to locals. Natai Beach, a clean, quiet, and unspoiled beach, is perfect for relaxing and activity. The waves are moderate and provide a gentle backdrop for scenic photography. Take a walk along the fine sandy shores, or walk to the pier. With amazing sunsets enjoyed by tourists and locals alike, it is an ideal spot for packing a picnic and soaking in a carefree evening. Thai Mueang Beach offers clear waters nestled against a white sandy beach. Near the Tableau Naval Base, the beach is sloping and backs up to fine forests and mangroves. This beach runs parallel to the highway to allow for easy access. From November to February each year, sea turtles arrive to lay their eggs on the beach. In March, the sea turtles hatch and the local area hosts its annual "Sea Turtle Releasing Festival". This is an up close look at nature as the baby turtles begin to make their way to the sea. Bang Niang Beach is an excellent choice for couples and families with young children. The water is shallow and calm, with excellent swimming conditions at any time of day. The sand is fine and free from rocks, which makes it perfect for a barefoot walk or a run through the sand. Collect and hunt for sea shells, which can be found after high tide. Although the tide makes the water a bit more cloudy than at some beaches due to the sediment, the water is still clean and beautiful. Tours and outings can be arranged from vendors at this area. Bars, restaurants, and local shops are plentiful and an inviting way to spend the day. Khuk Khak Beach is a lively beach lined with resorts. With clear water, this beach extends for miles. It is situated near a small fishing village, and in the evening, you can watch for the fishermen as they prepare for their evening of fishing. A market and bus station, as well as a few local eateries and shops dot the area. Unique sites await at Pakarang Beach, also known as Coral Beach, visitors during the rainy season will see the dead coral wash up onto the shores. The waves can be moderate to choppy on this beach at times. Local cuisine can be sampled at the restaurants close to this beach. As an interesting excursion to your beach day, you can explore a shipwreck in Laim Pakarang, which is in close proximity to the beach. Pak Weeb Beach enjoys one of the most beautiful stretches of coastline. Close to Cape Pakarang, Pak Weeb Beach has warm and inviting water and gentle waves, perfect for swimming and water sports throughout the year. Locals operate seasonal restaurants and small shops near the beach. Spend the day playing at the beach, then take in the scenery and nature on a stroll to the Pak Weeb waterfall and Baan Pak Weeb Monastery. Bangsak Beach is a quiet and beautiful beach oasis. With fine sand and shaded restaurants, this beach is an ideal place to watch the sunset. The waves are excellent for bodysurfing. Ao Chong Khad Beach is part of the Chong Khad Channel, near the national park headquarters. It lies between North Surin Island and South Surin Island. The water is shallow, but with high currents, and quickly rising tides. Ao Mai Ngam can be reached by hiking through the jungle or by taking a small boat to the northwest coast of North Surin Island. This scenic beach, with typically calm and tranquil waters, offers an opportunity to wade out to view the coral during low tides. For snorkeling, visit the Ao Pakkhad Beach. Pakkhad coral covers over the entire area of the bay, and is home to the largest variety of butterfly fish in all of Thailand. Look for the leopard sharks and sinsamutr fish that are also found in this area. Ao Tao, which means "turtle" in Thai, is the residence of the Hawksbill Sea Turtle. a variety coral can be viewed from the beach, including soft coral, or take a look from the steep downward slope, to see sea fans as well as other coral of many shapes and sizes. Whale sharks and manta rays can also be found in this area. Sunset Beach offers clear water, low tides, and white golden sand. Resorts cover much of the beachfront, as this well known beach provides a beautiful view of the water. Snorkeling is often good in this area for spotting a variety of fish and plants. Bang Lut Beach is a secluded bay on the western coast of Phang Nga. A fishing village is on the north end of the beach along with a small fishing pier. Without any development on the powdery sand beach, the atmosphere remains serene. Enjoy the lush greenery of the palms and casuarina trees around the beach. Nang Thong Beach is often a boisterous center of activity. With many bars, restaurants serving a sampling of local Thai foods, and interesting shops for browsing, there is always something to do. The water here is tranquil and excellent for swimming and sunning on the sand. Phang Nga is a beautiful destination in Thailand with stunning beaches to suit every interest. With friendly people and nature at every turn, Phang Nga is a complete vacation destination. 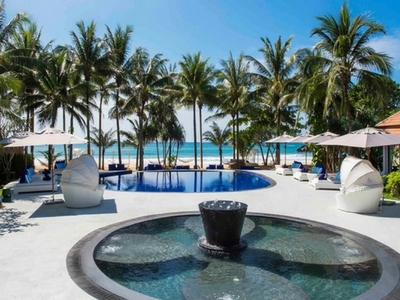 Located on the pristine sands of Natai Beach just 20 minutes north of Phuket International Airport, this Phang Nga resort is where the hip movers and sand shakers come to play and slay. With 58 stylish rooms, suites and villas complemented by lashings of in-room comforts, and appealing facilities including beachside massage salas and a fully equipped fitness centre, the beachfront member of the akyra family offers an enchanting escape full of hip happenings and stylish surprises. The resort’s integrated Club akyra is where you’ll want to head for après-beach fixes served by cool poolsters and sand bunnies. The style setting waterfront spot hosts fabulous weddings and events, plus regular theme parties with DJ fuelled fun and a delectable Weekend Beach BBQ. Whether it’s a sultry tropical sojourn for two, or a mates’ escape to paradise, akyra Beach Club Phuket ticks all the beachside boxes. 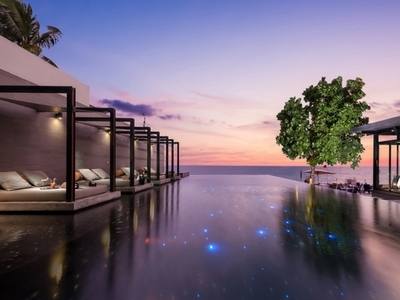 Located on the sunset side of the Andaman Sea and the pristine Natai Beach, this five star Phang Nga resort is just 25 minutes north of the Phuket International Airport, short distance away from the Blue Canyon Golf Course and the picturesque Phang Nga Bay. Aleenta Phuket Resort & Spa offers a beautiful and private setting and is a perfect location for a romantic beach wedding and honeymoon. Aleenta’s wedding planner is available to help create your dream celebration.